The LC450H landfill compactor, Volvo’s first purpose-built landfill compactor for the North American market, is powered by a 416-hp Volvo D13J Tier IV Final engine. Volvo Construction Equipment has long been committed to the waste and recycling industry with wheel loaders, excavators, haul trucks and attachments. Now, Volvo has applied that industry and equipment expertise to the development of the LC450H landfill compactor, the company's first purpose-built landfill compactor for the North American market. 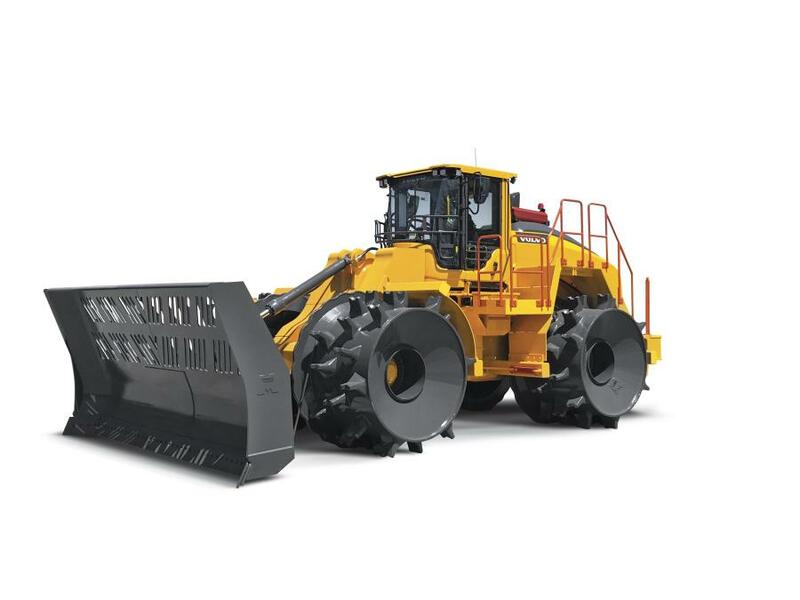 Volvo partnered with Terra Compactor Wheel Corp., a manufacturer of landfill compaction wheels, cleats, rolling wire guards and machine parts, on the development of the LC450H. The 90,000-lb. (40,823 kg) LC450H is powered by a 416-hp Volvo D13J Tier IV Final engine. Working in cooperation with the engine and the axle is an HTL310 transmission with lock-up converter, delivering high torque output and excellent fuel efficiency, according to the manufacturer. Terra wheels come standard on the LC450H, with the option of two-cleat patterns and three-cleat configurations. Adding to the durability of the machine, the cleats are each 8.5 in. (21.6 cm) tall with hardfacing on the tips for longer wear life. Two striker bars covering both the front and rear wheels to keep material away. The LC450H can be fitted with a Terra semi-u blade or a straight blade, giving operators the option to pick the blade that best fits their needs. The LC450H landfill compactor also is designed to deliver a productive and comfortable work environment. The Volvo Care Cab provides enhanced visibility, comfort and ergonomic controls, helping the operator stay comfortable and productive throughout the shift. The spacious air-conditioned interior is insulated from noise and vibrations. With a large expanse of glass, the ROPS/FOPS protected cab provides an unobstructed view of the job site. Visibility is further improved with the standard rearview camera. With air quality always an important consideration in landfill applications, the LC450H comes standard with a Respa cab filtration system. The system includes a powered precleaner, filter and pressurizer in one unit, providing high-quality filtration and pressurization. Comfort drive control (CDC) comes standard on the LC450H, allowing the machine's steering to be controlled by a joystick. The machine's single lever control with integrated forward/neutral/reverse and first gear kick down gives the operator the choice to control the transmission from his left or right hand. The LC450H has service and maintenance features that promote high uptime. This includes a frame that provides easy access to conveniently grouped checkpoints. All major components are easily accessible from ground level or the platform. The LC450H will be eligible for a free year of ActiveCare Direct, the Volvo telematics service that provides 24/7/365 machine monitoring and fleet utilization reporting directly from Volvo. For more information, call 717/532-9181 or visit www.volvoce.com.